Do you want to remove or hide Facebook Questions listing from your Facebook newsfeed? By default, this is not possible, as Facebook does not provide option to disable and remove Facebook Questions content from the newsfeed. However, using browser extension(s) you can easily turn off and hide Facebook Questions listing (even Facebook Poll Questions) from the default Facebook newsfeed. 1. 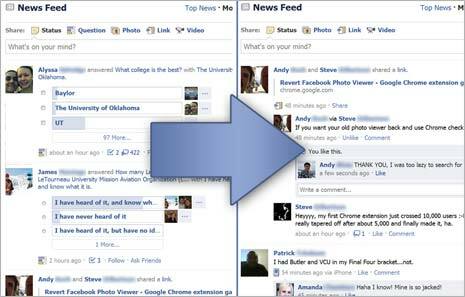 Launch Google Chrome browser and open Hide Facebook Questions Chrome extension webpage. 2. Click Install button to download and install this Chrome extension. 3. After install, refresh Facebook webpage by clicking refresh icon (or press F5 key). The Facebook newsfeed webpage will load much neater and cleaner without listing of Facebook Questions content from your Facebook buddies. You can also use Fb Purity extension for removing Facebook Questions in Google Chrome, Opera, Safari and Firefox browsers. From the install page, select extension for the browser you use. Latest version has option to hide Facebook Questions from the default newsfeed.